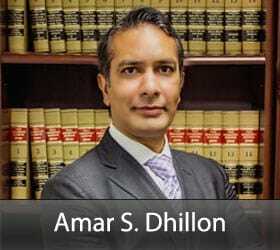 Amar Dhillon Personal Injury Attorney | Branch & Dhillon P.C.Branch & Dhillon, P.C. Amar Dhillon grew up in Fort Worth, Texas. He was admitted to the Texas Bar in May 1999, the Washington D.C. Bar in 2003, and the Virginia Bar in 2005. Amar started his legal career in 1999, in the Arlington office of Bailey & Galyen, P.C. He practiced personal injury litigation, family law, and immigration law. In 2004, he started the Branch & Dhillon office in Texas and in 2005 started the Dhillon Law Firm office in McLean, Virginia. Amar is an expert in personal injury cases, especially in motor vehicle accidents. He has also successfully handled motorcycle and bicycle accidents, dog bites, food poisoning, slip and fall, medical malpractice, and pharmaceutical related injuries.